It was the latest obituary for the knuckleball, a pitch mastered by older pitchers. In 1991, there were only two major leaguers throwing the pitch, older pitchers Tom Candiotti and Charlie Hough, The San Francisco Chronicle wrote. But, there was also younger pitcher Vince Herring, a knuckleballer pitching at high-A San Jose. Hope resided with him of carrying on the pitch, The Chronicle wrote. "He was 7-3 with an ERA of 4.97 as of last week," The Chronicle wrote that July, "but give him 20 years and he should be in his prime." The knuckleball pitch lives on, though still only in the hands of a few. Herring, though, wasn't able to carry the mantle himself. Far from 20 more seasons, Herring played just two more, never making it above AA. 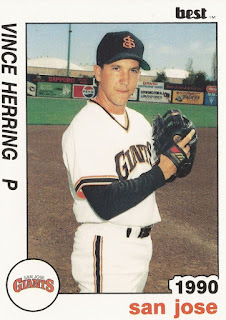 Herring's career began in 1989, signed by the Giants as a free agent having played college ball at Sonoma State. At Sonoma State, Herring remains among the leaders in multiple categories. In 1988, he recorded 9.91 strikeouts per nine innings, still second all-time. That season, he punched out 80 total batters, still 10th on the list. In 1989, the year he signed with the Giants, he recorded a 2.66 ERA in 91 innings pitched. Herring started with the Giants at rookie Pocatello, getting 18 relief appearances and posting a 5.25 ERA. He also recorded a save. For 1990, Herring moved to high-A San Jose. He got 35 relief outings there, and two saves. His ERA finished at 3.41. Herring returned to San Jose in 1991, recording 11 wins, picking up nine starts and 30 more relief outings. For 1992, he pitched at San Jose again, getting 19 outings and posting an ERA of 1.23. He also earned a promotion to AA Shreveport. At Shreveport, Herring's ERA moved north of 4, at 4.06, in 23 outings. It ended up being his final year with the Giants and in affiliated ball. He moved to independent Sioux Falls for 1993 getting 21 outings, 14 starts. They were the last outings of his pro career. Herring has since gone on to be a coach, returning to Sonoma State as pitching coach. He is continuing as pitching coach at Monterey Peninsula College in 2016.